Launchpad is an application launcher for macOS, which first appeared when the Mac OS X Lion operating system appeared in 2011. You can easily organize Launchpad, delete Launchpad icons and even clear icons that were left after uninstalling the associated application. 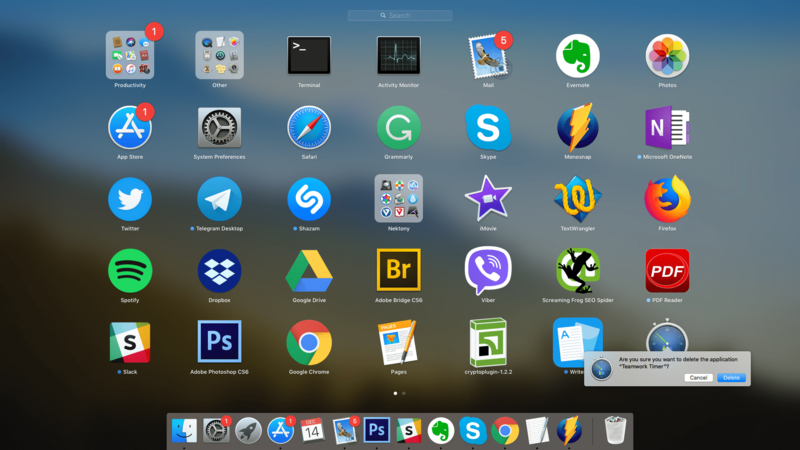 In this article, we would like first to explain how to delete apps from Launchpad and then provide an alternate method of uninstalling apps on a Mac. How to delete icons from Launchpad? How to remove apps correctly? LaunchPad is a special mode on a Mac, which displays all applications from the Applications folder as a grid, like on the iOS device screen. If there are too many programs on your Mac, they can be displayed on several pages in the Launchpad. Launchpad is a clear and intuitive presentation for applications installed on a Mac. At the same time, Launchpad gives you the ability to organize your apps in a convenient order and quickly run the apps you need. How to remove icons from Launchpad? Press the Alt (⌥) key on your keyboard. The icons will start flashing and you will see the “X” sign on each of them. Click it to remove an icon from Launchpad. Another way to initiate the deletion option is to click on the icon and hold it. You will again see the “X” sign. Click it and confirm the deletion of the application. If you cannot delete icons from Launchpad with first two methods, try the last one – drag an icon to the Trash in the Dock panel. The methods described above for uninstalling an application on a Mac are recommended by Apple. However, you should note that deleting apps from Launchpad or even from the Applications folder does not guarantee that the app has been uninstalled completely from your Mac. What does this mean? When you run any application on your system, it creates service files and stores them on your disk. These service files include cache, logs, preferences, launch agents, login items and other extensions. Service files are important to make apps work quickly and smoothly. But when you delete apps using any of the methods described above, the service files remain on your Mac and still occupy disk space. It is important to uninstall programs on a Mac completely in order to keep from cluttering your disk space with junk files. From our previous article, you can learn three ways to completely remove apps on a Mac. Or just read on to learn the easiest, quickest and safest way to uninstall apps on a Mac. When it comes to uninstalling apps on macOS, including all their support files, you can do it with just a few clicks. To achieve this, use the special tool App Cleaner & Uninstaller, which automatically finds the service files of any program and allows you to remove them safely. Here is how it works. You run App Cleaner & Uninstaller and the program starts scanning all your apps from the Application folder. Then all you need to do to remove an app with its service files is to select it and click the Uninstall button. Even if you have already removed some apps in the regular way and don’t see them in the list of apps, don’t worry. App Cleaner & Uninstaller also finds the leftover files of previously-removed apps. To see them, switch to the Remains section. Select all the useless leftovers and click to Remove them. On the screenshot above, you can see that service files may occupy a huge amount of space on your disk. Regularly clearing your disk space of unnecessary files helps to optimize your disk and improve performance. While you may have begun reading this article in order to learn how to delete apps from Launchpad, we hope that we have managed to persuade you that such a method is incorrect and does not actually remove a program completely. Once again, you can remove the service files of unneeded apps manually or use the removal tool, App Cleaner & Uninstaller. App Cleaner & Uninstaller provides a free trial for seven days, so you can get started today with cleaning up your Mac from unneeded apps and files.